I am sharing my design experience, because: 1) my design background legitimizes my design and project management skills, and resources to restore the property in Caltabellotta Sicily into a Center for Inspiration, 2) perhaps some of my work may inspire, 3) I welcome any emails or phone calls from students whom have any questions, especially concerning European studies and travels. With trying to remain as humble as possible, I have lived a stellar life, especially concerning my European experiences, design and product development on both a National and International level. I consider 1986, at Domus Academy in Milan, to be my baptism not only into the design world, but to my adult life. When looking back , I was so fortunate to be so young, to be accepted as a family member to the Italian design community “the family”, which opened up so many doors for me in the International design community. How incredibly fortunate to have collaborated with the famed designers: Ettore Sottsass, Emilio Ambasz, Philippe Starck, and Ingo Maurer. Absolutely unbelievable! Each has been a mentor to me, in their own special way. These 4 designers and my students understand I have a very unique gift, not just my creative mind but my infectious energy and enthusiasm. Throughout my professional career I have been a senior designer and project manager at both small European studios and large American corporate offices. Over the past 11 years I have also managed every detail of my product development: from my initial sketch of an idea, fund raising, engineering, prototyping, tooling, graphics, packaging, and manufacturing. Most of my product development is in Italy.I have lived many years in Italy. As a result, I am well versed on the many levels of getting something Made in Italy. I have enjoyed all my teaching experiences, which I actually refer to as “facilitating”, because to me it is important not to turn the students into a clone of me, but to recognize and nourish each of their unique gift/skills. I have had a few incredible mentors in my life, and it is wonderful to feel I am doing the same. Teaching is really the act of giving back, to the next generation, and the greatest reward is when a student tells you that you have made a difference and inspired them. It is all about inspiration! Ettore Sottsass: my employer, mentor and friend. The random encounter with this image in the Fall of 1985 changed my life. Seeing this image was my baptism into the design world. After seeing this image, Milan Italy was my quest. Not only did I study at Domus Academy in 1986, under Andrea Branzi ( the writer of “The Hot House” ), but in 1987 Ettore asked me to work for him, in his studio, Sottsass Associati. Unbelievable! In my first two years in Milan I studied under and worked for my two design gods. I was such a young disciple, 23 and 24 years old. Both have been supporters of my work over the years. In 2004 Ettore and Andrea encouraged me to put a book together of not only my design, sketches, observations, and artwork, but my lifes stories. In support they both wrote forewards. For further details: Scroll down, and at the very bottom, in ( Product Stories ) to read ( A touch of Genious ) a few very endearing stories concerning Ettore's gift: his instinct to sense the slightest detail of any situation ( usually in his subconscious layers of observation and interpretation ) and arriving at a room silencing solution. For me, it was a gift to witness Ettore on a professional, public and personal level. He was calculated but also spontaneous, confident but also extremely humble. Most of all, he was never afraid of any external stimulation entering at any moment. I was one of the designers for desktop products, for a company formed with David Kelley, called Enorme. The main graphic identity for Enorme, was a Sumo wrestler in bright green. I designed pens, scissors, calculators, and other desktop products for Enorme, cutlery for Alessi, lighting for Phillips, and an exhibit for Alessi. This sketch was one of my first for the calculator. My thought was to group the various functionalities into separate families, cohabitating in the same neighborhood, some having higher social status than the other, along with hierarchy of importance ( usage ). I was also interested with the orientation of the calculator itself. How do we orientate ourselves to an everyday object? A refined design, as a result of my first review of sketches with Ettore. Ettore wanted the calculator to be very thin, and white, as if it was a piece of paper on the desktop. I had designed several products, tableware, shelving/storage systems, retail merchandising displays and a lobby, but the toothbrushes have a life of their own. There was an individual in Emilio’s office designing very architectural looking toothbrushes, not at all visually or physically comfortable, let alone the problems with their use. After Emilio noticed this, he asked me to design a line of toothbrushes. The initial toothbrush was the whale, which was visually pleasing, portraying a comfortable toothbrush to hold and use. The reference was innate for me: the toothbrush bristles representing the whales’ baleen. The baleen is a filter-feeding system, where food such as microscopic plankton is captured, as the toothbrush bristles capture food particles. The whale also represents a graceful, calm, smooth, non-harmful living creature: so psychologically soothing. My second design was a seal. My designs were some of the first two-component co-injected molded toothbrushes on the market. For further details: Scroll down, and at the very bottom, in ( Product Stories ) to read about my interesting first encounter with Emilio. I was excited because here was a chance to design not just an object, but to study the social issues and interaction. For further details: Scroll down, and at the very bottom, in ( Product Stories ) to read about Starcks’ genius, and how my ashtray was produced. I was probably spoiled to have had Knoll as my first product produced, under my name, because from the initial review of sketches to public presentation, was less than 6 months. I am very grateful to Carl Magnusson for his instinct, drive, and his belief in me and my work. For further details: Scroll down, and at the very bottom, in ( Product Stories ) for all details of the development of this collection, and one of my favorite stories. This is a recent product / invention of mine. I designed, coordinated engineering, prototyping, tooling, raised investment capital, and am currently manufacturing. This chair is about discoveries. Discoveries of not just what this product is, but the discovery which you experience when using it. The name itself triggers curiosity, and when you finally fiqure out what exactly the product is, whether by someone informing you or by your experiencing its initial insertion into the sand, you experience the discovery factor behind this design. This chair is lightweight, whimsical, with the right amount of technical suggestion, easy to carry, and most importantly it offers a comfortable back support, for your sitting pleasure. Why is there not a pivoting seat which folds down from the backrest? Because I wanted to retain the connection of our bodies with "Mother Earth", in this case her glistening sand. The sand offers a natural cushion which conforms to each of our uniquely individual contoured behinds, our " personal seat cushions." 1 Simply grip the chair and insert into the sand. inserting. Stop when the horizontal support ( bottom of the back rest ) firmly touches the sand. June 23, 2008 – October 22, 2009 Lived in the majestic Austrian Alps. Designed, coordinated fabrication of site specific furniture, lighting and accessories for a hotel / spa. I designed, coordinated engineering, prototyping, tooling, raised investment capital, and which I am currently manufacturing. The Rockwell Group: design and development for The Coca-Cola Company®: bottle, packaging, and merchandising, along with merchandising for The Coca-Cola Company coffee brand, Chaqwa. I was also involved in designing furniture for the lobby of several Sheridan hotel locations. Ogilvy Group inc: container packaging for Ritz crackers: a double wall allowing for cracker protection, and the ability to insert and protect the cheese applicator. My focus was also on container reuse. Collaborated with several manufactures: Alessi, Artemide, Baleri Italia, Danese, Flos, LucePlan, and Magis. Consultant. I was given carte blanche to explore “new platforms” in office systems, storage, and lighting. One result of 9/11, was the entire marketplace re-examining priorities. Haworth stepped back, focusing on "in house" design. This created an opportunity for me to move back to Italy. Ingo Maurer invited me to design a table lamp, which we jointly developed. It was a very inspiring collaboration. Senior Product Designer. I was hired to create a “culture of innovation” in Steelcase, while leading projects inside IDEO. Consultant. projects included: high tech handheld devices and headsets for Motorola, espresso machines. Quality Assurance Manager: Responsible for total quality of all products manufactured. Coordinated all aspects of quality with the production supervisors, engineering, and sales. Production Manager: Directed all facets of manufacturing processes. Addressed production efficiencies and implemented production improvements to streamline the manufacturing processes. Worked with the shift supervisors to evaluate personnel and staffing requirements. Consultant. Designed a family of shampoo bottles. Collection of side and occasional tables. June 1990 – December 1991, I lived and worked in Paris. Philippe Starck invited me to design, then produced one of my designs ( "Niki" 1990 ) for the company OWO, whom Starck was the art director. Alessi purchased OWO in the mid 1990's. I had also designed furniture for various other companies, whom Starck was their art director. Product Design: cutlery for Alessi, office accessories for Enorme, lighting for Phillips, and door handles for Vali & Colombo. A third – year course introducing functionality, material usage and manufacturing processes. Students broadened their scope and the importance of furniture design, both aesthetically and culturally. Project Leader for the first seminar of the Masters Program in Design. Set project concept and direction. Examined the issue of well being as perceived in current time in terms of products and lifestyle. A first – year course on history, theory, and application in Industrial Design. Master of Design, December 1986 “Scenographia Urbana”: masters project in urban scenography with Andrea Branzi. BFA Industrial Design, June 1995 Yes this date is correct. I have an interesting story on how I received my Masters before my BFA. Note: I was a wedding planner for ( 4 ) weddings in Italy, and in June 2009, became a certified mountain guide in the Austrian Alps. Note: It has been many years since I have updated this. There are so many various publications and auction sales I need to add. THE KRANNERT ART MUSEUM, Champaign, Illinois “ Your design Heritage” celebrating 70 years of Industrial Design at the University of Illinois at Champaign-Urbana. April 28 – July 28, 2006. In the permanent collection: ( 2 ) tables from my “Cactus Collection” for Knoll, ( 1 ) Saguaro and ( 1 ) Toothpick. THE MUSEUM OF MODERN ART, NEW YORK, “ WORKSPHERES” Design and Contemporary Work Styles, February 8 – April 22, 2000. Exhibition book pg. 166/167 “ Agent, the nomadic office”. The “ Agent “ is my contribution with IDEO Design & Product Development. ALESSI DESIGN MUSEUM, Crusinallo Italy. In the permanent collection: ( 1 ) ashtray “Niki“, which Philippe Starck produced. THE CHICAGO ANTHENAEUM, Museum of Architecture and Design, “ GOOD DESIGN 1995 “, October 24 – January 13, 1996. In the permanent collection: ( 2 ) tables from my “Cactus Collection” for Knoll, ( 1 ) Saguaro and ( 1 ) Toothpick. MUSEE DES ARTS DECORATIFS DE MONTREAL, Canada. “ A Perspective on Design “, June 18 – September 19, 1993. In the permanent collection: several of my furniture sketches, for the table and chairs, titled “Who supports Who”. ART & TABAC curated by Pierre Restany. Galerie Theoremes, Brussels Belgium, June 28 - July 6, 1996, pg. 24 / 25. ART & TABAC Palazzo delle Esposizioni di Riccione ( Forli ) Italy, 1995. ART & TABAC Galleria EOS, Milan Italy, May 1994. Honorable mention award. Merchandise Mart, Chicago, ORGATEC in October 1994. FANTASY OBJECTS Poltrona Frau ( Galleria Frau ) New York, 1993. POUR LA VIE curated by Philippe Starck for the OWO Collection. November 5, 1991 at La Cigale, 120 Boulevard Rochechouart, Paris France. POUR LA VIE August 6 – November 1991, 27 bis. Bd. Raspail, Paris France. LUCI – LIGHTS Memphis Milano, June 22 – July 16, 1988. Memphis showroom Via Manzoni, Milan Italy. A BROAD ARCHITECTURE New Milan, June 3 – June 27, 1988. Struve Gallery, Chicago Illinois. NOVE LIGHTS curated by Aldo Cibic. Superstudio, July 1987, Milan Italy. Note: In 2004, both Ettore Sottsass and Andrea Branzi encouraged me to archive all aspects of my creative life, and publish a book, which they said will be very inspiring. Both asked me if they could write a text, a Foreward for the book, which Ettore did on June 7, 2004, and Andrea Branzi did in August 2004. Pierre Restany, February 1993, Paris. Pierre Restany, March 2002, Paris. A very gifted designer, very gifted indeed, with an innate sense of elegance and stylistic complexity. Note: In my entire design history I have only entered 2 designs for design awards, my collection of tables for Knoll, and my beach chair ( www.beachthingy.com ). Both swept all awards, 10 in total. HALLMARK HONOR PRIZE 1980. This was a National award for one of my high school pencil drawings. To date, I am most proud of this award, and the drawing which won. Note: the only two colleges I applied to, Northern Illinois University in Dekalb Illinois, and University of Illinois in Champaign – Urbana, I received Talented tuition scholarships. SOTHEBY’S CHICAGO, Sale 7175, THE 20TH CENTURY SALE FINE AND DECORATIVE ART, November 8, 1998, Lot 282 aluminum prototype table lamp 1987, Lot 284 pair of drawings. SOTHEBY’S LONDON, Sale LN3729, DESIGN SINCE 1935, October 29, 1997, Lot 952 “ELASTICO” MEMPHIS lamp 1988, Lot 953 “ SBARRA “ MEMPHIS lamp 1988. THE INTERNATIONAL DESIGN YEARBOOK #10, 1995, edited by Jean Nouvel, pg. 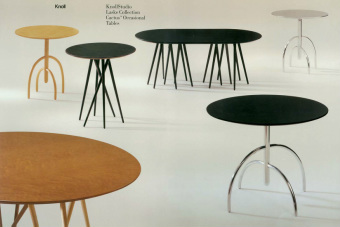 83 Toothpick table for Knoll “ Cactus Collection”. INTERNATIONAL LIGHTING DESIGN , 1991 ( Rockport Publishers ), curated by Lorenzo Porcelli and Donna Green. LA QUATRO METROPOLI Design e Cultura Ambientale ( The Fourth Metropolis Design and Environmental Culture ) DA Domus Academy Edizioni. Andrea Branzi, December 1990, pg. 42 – 45. CHICAGO SUN – TIMES, Sunday January 23, 1994. Home section. Designer profile, “ MAKING IT “. CHICAGO TRIBUNE, Sunday June 20, 1993, Section 15 Home section. ABITARE # 424, Gennaio 2003, “ 15 Countries, 15 Designers, 15 Products “, StandPlant pg.159. INTRAMUROS, no. 102 Aug Sept 2002, StandPlant, pg. 87. COSMOPOLITAN HOME Grand Rapids, Jan / Feb. 2001. Designer profile, pg. 26/27 “ An Evolution in Organic Design”. BUSINESS WEEK, March 6, 2000, pg.104 /105 “ AGENT “ Design concepts for a wireless world. My contribution with IDEO Design & Product Development. THE NEW YORK TIME MAGAZINE, Home section, Sunday October 15, 1995. pg.46. THE INTERNATIONAL DESIGN MAGAZINE 40th ANNUAL DESIGN REVIEW, July / August 1994, pg. 161, honorable mention. ABITARE # 325 January 1994, pg.148 “ Mobili e oggetti da tutto il mondo “ ( Furniture and objects from around the world ). CONTRACT DESIGN # 11, November 1993, pg. 71, IBD Silver Award. CONTRACT DESIGN # 10, October 1993, pg. 32.
INTERNATIONAL CONTRACT, July 1993, pg. 34, showcase. DESIGN JOURNAL, June 1993, NEOCON Chicago. INTERIOR DESIGN SHOW DAILY, June 15, 1993, NEOCON Chicago. FP Fusion Planning # 33, Nov. 1990 – 11, pg. 83. CROISSANT # 310 ( Japan ), July 25 1990, pg.84. AXIS # 36, Summer 1990, pg. 19. FP Fusion Planning # 27, Nov. 1989 – 11, pg. 103. DONNA International Fashion Magazine, July 1987, pg. 5. I immediately wrote a letter, asking for any information on design schools in Milan, and I mailed it to many design and architectural offices. I did not receive any replies, but something special happened, I looked at the back of an issue of Domus magazine, and there was a full page advertisement for Domus Academy. I called, then sent 20 slides as asked and a letter. Remember these days were prior to personal computers, email, and the internet, so perhaps difficult for the younger generation to imagine my excitement when I received a telegram, congratulating me on my acceptance to Domus Academy, for the 1986 academic year. The first time I met Ettore was when he co presented a lecture with Andrea Branzi at Domus Academy. It was the first lecture. WOW! Not just Ettore but side by side with Andrea Branzi, author of The Hot House, which I was just introduced to and started reading. This book was the Bible for understand Italian design. Here were two design Gods. Andrea Branzi was the director for Domus Academy, and I was thrilled to do my Masters thesis under his guidance. I was only 23 years old when I was at Domus Academy and Ettore Sottsass asked me to work in his studio, Sottsass Associati. In fact Ettore asked me to work with immediately, but I stated that I had three more months at Domus Academy, and that is my focus at the moment. I met at Ettore’s studio in the first week of September and all he said was to return on January 9, 1987, after their Christmas and New Years Holiday and a table will be waiting for me in his studio. I did not ask for nor receive any contract, only a hand shake and Ettore’s word. We did not even discus any money. He only said that I would be able to live in a simple apartment and eat modestly. I had no communication with Ettore or his office after meeting with him. On January 9,1987 I arrived at his studio on Via Borgonuovo 9 ( 3 entrances away from Giorgio Armani ), presented myself to his office administrator, and was told my table is waiting for me. I could hardly contain my excitement. I had just passed my first year in Milan, and at Domus Academy. Every second of ever day was exhilarating. Every one of my senses were peaking. I had an insane amount of energy and enthusiasm. What could possibly surpass such a extraordinary year? The answer - to have had the opportunity to collaborate with and work for Ettore Sottsass. How does anyone explain an unspoken communication, an unexplainable attraction, besides perhaps using one word, fate. In our personal and professional relationships, it is so extremely rare to really connect, to truly feel a collaboration, the real joy of being with someone. It is wonderful to recognize it, when we are so young, so that we can cherish every moment, not to simply find ourselves reflecting in our old age. I was extremely fortunate ( blessed ) to have had Ettore in my life. Since the moment I met Ettore, I recognized that he was and always will be the most important, most influential creative person in my life. I was so young, just 24, I realized what great presence I was in and would witness in the time I worked in his studio, and all the years following in our meetings and conversations. Enorme: David Kelley formed a company named Enorme, who’s ( based on Ettore’s studios recommendation ) graphic identity was a Sumo wrestler in bright green. The Enorme product line started out with desktop accessories. I was one of the designers, and I designed pens, other desktop products. My first professional design was for Ettore, a scissors for Enorme, and immediately following, s calculator. I was also one of the designers for the famous Enorme telephone. Scissors: One of the first sketches I did for Ettore was of a scissors. It is a pivotable sketch for me, in that it represents everything that Ettore represents to me. It reinvestigates the product and how we interface with it, both physically and psychologically. I am sure, although I can’t remember, the first time I picked up a scissors, and going through a learning curve to how the scissors actually worked. Anything we use, there existed some form of learning curve. My sketch for the scissors ( and an actual model I made ) reminds us that we take so many things for granted, and what it would be like to have to relearn how to use something. One example would be a stroke victim or any debilitating accident, where an immense amount of mental and physical communication is needed to relearn to perform a particular task. Normally we open a scissors by moving our fingers apart, then closing our fingers so the scissors blades cut. I have designed the opposite. To open the scissors you must close your fingers, and to close the scissors, you must open your fingers. Without any visual clue, or model to articulate, try it. You will find that there is a learning curve. Do not get frustrated that it may not be immediately apparent, just enjoy the discovery process. Ettore loved my sketch, the model, and the idea, because it completely reexamines the product, allowing for discovery and surprise. Ettore said to me “sei pazzo”, with a very endearing tone. It simply translates: you’re crazy. I took it as a compliment. Ettore then asked me to develop a scissors which sane people can use. I look at this sketch now and think “how horrible is the geometric / shapes”. I admit, I was unfamiliar with Ettore’s product design language, as was the rest of the world. My thought was that each individual geometry represented a particular function, so I should represent it. after this sketch and review with Ettore, I did design a very elegant, all metal scissors, which today would find itself in a glass showcase at the MOMA store. The scissors was never produced. Calculator: Ettore did not give me any brief, only asking me to design a calculator, and that he would see me in a week for a review. Every one in the studio knew my energy, and the amount of ideas and sketches I can produce in a day let alone a week. There was an amazing energy in Milan and Ettores’ studio during the mid to late 80’s. Everyone was curious, excited and supportive of one another. I could feel everyone looking forward to my review with Ettore. The studio was small and intimate. Everyone tuned their ears in, if not actually present at a review. My thought was to group the various functionalities into separate families, cohabitating in the same neighborhood, some having higher social status than the other, along with hierarchy of importance (usage). I was also interested with the orientation of the calculator itself. How do we orientate ourselves to an everyday object? My # 1 Ettore Story: The following is an example of Ettore’s creative intuitive grace, his instinct to sense the slightest detail ( especially others energy ), and add his creative genius. A week passed and I sat at a large table with several others from the studio, waiting for Ettore to arrive. I could feel this moment with Ettore would be magical, maybe I was just so excited for my first design review with Ettore. I sat in my position at the end of a large table, to the right was were Ettore was designated to sit, all the other seats were filled. I placed, centered where Ettore would sit, a stack of sketches I had produced in the week. Stack? A mountain was more like it. Spalding Gray and “The Monster” came to mind. To the right of the stack of sketches, I placed a small stack ( apr. 10 sheets ) of white paper, with a black pen so obviously centered on the top. This was rediculously orchestrated, as if I was organizing a place setting for a formal meal and special dinner guest. Ettore arrived and sat in his position. Everyone could see that Ettore understood my cute nervousness and that he wanted to break out with an endearing laughter, but he did not. Ettore let the curious tension build, until he looked at my “Monster” and said, “I see you’ve been busy.” Everyone immediately let loose their contained laughter, as I did. What follows is just one example of Ettore’s brilliance. He said “I cannot possibly go through them all, so I will eliminate some, and for those I don’t even look, it won’t bother me, because I will never know what they were.” Ettore proceeded to cut the stack like a deck of cards. He took a few from the bottom of the stack and put them on the top, saying “I will give those in the back a chance.” Then he cut the deck in half and setting the top ½ aside, saying “those I will never know about”. So much for giving those few on the bottom a chance. They would have been better off staying on the bottom. Ettore then proceeded to cut the selected ½ stack in half again, discarding the top ½. Ettore continued this process of random elimination until he had an amount of sketches he was comfortable with, 12 pages to be exact. Ettore selected a particular sketch and started to discuss details concerning the calculator buttons. Ettore started to sketch directly on my sketch, indicating where he thought the buttons should be, and as he was about half way through he asked me “you don’t mind if I sketch on your drawing” and I replied “of course not” my voice cracking with excitement. Everyone could see that I was so happy. It was obvious to everyone that each sketch I thought was historical, to me anyways, because at the bottom of each page was written: Larry Laske for Ettore Sottsass, dated and stamped with an official Sottsass Associati studio seal. I only kept the 12 selected sketches, I guess to be true to the idea that those drawings which Ettore eliminated were not of importance. I do have, and cherish that torn ( reconfigured ) sketch, drawn on by Ettore. I then created formal drawings based on my review with Ettore. In the lower left hand corner, Ettore indicated with an asterisk, his design approval, and which to proceed with in making a full scale model. It was Ettore who mentored my inclusion in MEMPHIS, and he has always known my gratitude, on so many levels. I remember vividly hearing about the up and coming Memphis show, and the excitement in the studio. At that time Aldo Cibic and Marco Zanini were still partners and always present in the studio. When I overheard a few conversations of them discussing their ideas with others in the studio, I thought “ what a dream to design a piece of furniture for Memphis.” Remember my attachment to Ettore and the “ Carlton “. Well, not even a month into my working with Ettore, there seemed to be a shining star piercing the gray Milan air and penetrating through the only window into the basement / below street level space ( where the design studio was located ) directly on me. In fact the only idea that the outside world existed were the ankles and shoes we would see passing by. Ettore passed by my table as any other day, for I was situated facing the steps which led in and out of the basement studio, but this time he stopped, looked at me catching my attention which our mentors always do, and after a wonderful silent pause he said, “ Larry, do a few furniture sketches for Memphis and I will present them to Barbara.” Nothing more was said, as he left up the steps leaving me with an encouraging smile and my dream opportunity. Ettore did not have to give me a deadline because he knew me by now, the fact that I would most likely arrive the next day with a mountain of sketches. I presented Ettore with ( 16 ) sketches I did the year prior, when I was a student at Domus Academy, with the idea that they may be Memphis worthy, and one day I would present to Ettore. Concerning Ettore’s invitation, I produced numerous sketches, which focused on the relationship of the drawers and the cabinet holding them. Ettore liked the idea that the drawer and the cabinet do have separate identities while cohabitating, and the question of exactly “ who supports who “? I thought it was an impossible task when Ettore asked me to submit to him two ideas. A day or so later I gave Ettore the two sketches, which he took with him. There was not much time in between for me to sweat, because one or two days later Ettore returned and handed me the two cards saying “ both have been selected “ ( a red dot sticker was put on each sketch by Barbara Radice. I remember with very teary eyes thanking Ettore. Now I had to detail them, but first I on the way home purchased a bottle of spumante ( closest thing I could afford to Champaign ) opened it pouring it over my head as I stood outside on my apartment terrace. I felt I just won the Indianapolis 500 and was deserving of an appropriate congratulatory toast. I thought not bad for a 24 year old American who has only been in the Milan design community for less than a month. Believe me, I will forever be thankful to Ettore for his endless generosity. Ettore asked me to do formal drawings indicating materials. In just two days I produced several drawings using wood Abet laminate to delineate surface and shape, and predominately white. Ettore passed my drawings on to Barbara, which she approved and proceeded with fabricating my two designs. There was very little time before the Memphis show, so time was of the essence. During the next month, as I waited to hear the news that the prototypes were ready for my review, I made models of 6 of my designs, which Ettore liked. I know that Barbara had made her selection, but I still liked the pure relationship of the drawer to its body. I gave these models to Ettore, and he loved them. He presented them to Barbara. I received them back with a note that she liked them very much, but they have proceeded with her prior two selections. I could sense that I was about to be taught a lesson. The next morning I arrived down the steps to my desk to immerse myself in Ettores work, and I soon felt somewhat better. That afternoon Ettore walked down the steps, stopped at my table, looked at me ( once again his eyes capture you and you forget about whatever your worries were ) and said. “Sorry about your furniture.“ I could not hold back my look of disappointment. Ettore then said, “I have not announced it yet, but the next Memphis show will be his last. Gismondi does’nt even know that I will not design anything more for Memphis. It is a show of lighting. Sketch me a few ideas and I will see that they make it in the show.” I could only think, “ what an amazing man! Why is he looking out for me?” It has always been unspoken between Ettore and myself. Perhaps it is no different than any other father and son relationship where there is an innate caring and respect for each other. I know Ettore had seen something in my work and me as an individual, which is why he has always been supportive of my work. Ettore knows, because I have said to him on more than one occasion, that he is my mentor, really my spiritual design advisor. I am sure that Ettore was displeased my furniture designs were not included in the Memphis collection, but for Ettore to invite me to design lighting and to ensure me that my designs would be included in the Memphis collection, may have created conflict between himself and Barbara. Ettore possibly put himself in the line of fire to protect me, for he truly supported my work. The lighting show 1988 Luci-Lights Memphis Milano was the last show which Ettore participated. I was the lat Memphis show because without Ettore, there is no Memphis. I am happy that two of my lights were included in the Memphis collection and exhibition. I was now a member of a very special and important family in the Italian design community. I am happy to show my furniture designs for Memphis, but the two lights which were in the last show? Well, I was so young, not at all matured as a designer, only very playful, and it shows in the two designs. I do not even list my Memphis collaboration on my resume, as proud as I am about Ettore inviting me. Only those few Memphis designers understand that we are constantly defending Memphis. I personally am tired of the closed minds trying to debate with me, Memphis and design. I only respond: “I hope that when I am 70 years old, I will be able to stir the world with an idea of mine. I it is not necessarily the designs in Memphis but more importantly what it represented, and how it changed design. The whole idea was to open up a dialogue, and open dialogue.” True art is supposed to provoke! Ettore was tired of the world labeling him and not understanding Memphis, not even giving it a chance for a healthy dialogue - which is why he finally had enough and called it quits. Below: my MEMPHIS lamp history and invitation by Ernesto Gismondi to translate my MEMPHIS lamp into a mass produced lamp for Artemide. 1st presentation to Ettore ( February 20, 1987 sketches,) After Ettore invited me to design a few lamps, I went to the Jazz club, Tangram, and while listening to jazz and enjoying a large bottle of Chimay ( blue ), I drew these sketches. I presented them to Ettore, and he liked the what my thoughts were, and asked to study them in more detail, then he would present them to Barbara. 2nd presentation to Ettore ( April 1987 sketch of my preference ) I presented these to Ettore and he intern presented them to Barbara. She loved and approved the two designs. The two white square sketches should be dated March 1987, not April 1987. These were drawn in the first day or two of March, because I then had to work extremely fast to get Ettore and Barbara executive drawings. Courmayeur January 30, 1988 sketches ) Before the Memphis show, ( which was later in this year ), I spent the weekend skiing in Courmayeur. It is rare for me to give up a day skiing, but I sat in a restaurant and spent the day creating these 18 pages of sketches. The sketches combine the language of my lamps for Memphis but also move in different directions. I did present these sketches to Ettore, not necessarily for Memphis ( because I did not want to stir the water in any way ), but simply to share with Ettore. There were ( 4 ) ideas which I favoured, and Ettore encouraged me to prototype. He loved their architectural presence and playfulness. I did prototype the ( 4 ) lamps, with impeccable detail in brushed aluminium. I had all ( 4 ) working prototypes finished by the end of April 1988. Tom Vack ( also at that time fresh from Chicago ) photographed them. He also felt they had an architectural presence, factories. I have always had all ( 4 ) lamps in a crate and in storage, never touched or used. Only one I offered in a Sotheby’s sale in Chicago, and it sold. Sale 7175, The 20th CENTURY SALE FINE AND DECORATIVE ART, November 8, 1998, Lot 282, aluminium prototype table lamp. A year or so after the sale I was informed that the lamp resold to a private collector whom has a passion for prototypes, paying $10,000.00. The ( 4 ) lamps were always intended to be one of a kind, although a Family, a family of four siblings, sharing a common bond, but with very much different personalities. They are all designed to have a sculptural presence on the work surface, while providing light, 50 watt halogen. The other 3 lamps are pristine, and packed in separate crates, in storage. After the opening of the Memphis show, I had received a phone call from Ernesto Gismondi ( owner of Artemide and Memphis ). He personally called me to meet with him to translate my Memphis lamps into a mass manufacturable table lamp. I was elated. I was extremely nervous in meeting with Gismondi. Mainly because I was so young, and inexperienced ( as far as technical and mechanical skills are concerned ). Gismondi liked my lamps and the idea that the user has to perform a task, not just the usual motion in raising or lowering the lamp. He liked the idea that to articulate the lamp, a separate, independent element was needed. He did not know if it would translate well in the marketplace, because the consumer may be concerned that if the independent element was lost, then how does the lamp function. Ernesto was atleast curious, and we spent the next 6 months developing my ideas. My idea was, if ( more like when ) the independent element is lost, then it is up to the user to solve the problem, by inserting: a pencil, a chopstick, or better even – a tree branch. This is the beauty concerning self interpretation. I am also encouraging creativity. Ernesto had a few study models made, but it died there. I was frustrated, but very appreciative for the opportunity. My # 2 Ettore Story: I am sure that so many whom have spent time with Ettore, have such beautiful, memorable stories. The following is an example of Ettore’s innate sense of timing, inventiveness and creative genius. Antonia Jannone had organized a birthday celebration for Ettore at her gallery in Milan. The gallery was packed with everyone who had gathered in anticipation to celebrate with Ettore, leaving barely enough room to even turn around. The focal point in the gallery was Ettore’s birthday cake, which was not just any ordinary cake, but one fitting for a gallery setting, an absolute work of art, as was Ettore’s creative performance involving his solutions in solving a few cake problems. The cake was striking enough in that it was a continual tone of bright green, but its shape was monumental, fit for a king, a conqueror. The cake was comprised of several tiers, which would bring to mind Ettore’s early ceramic pieces, or his recent proposals for Bodum. All tiers were cylindrical, with a rise of approximately 8” and a run of approximately 8”. It was an architectural monument leading up to the heavens, with secret burial chambers holding treasures, hidden within. The base was approximately 32” in diameter, and with four tiers, the top plateau was approximately 8” in diameter. The room was filled with excited energy, awaiting Ettore’s arrival, but standing next to the cake, I could see that Antonia Jannone was looking a bit nervous. There stood this monumental cake, but where were the candles, the forks, the plates? You could just feel that at any moment Ettore would arrive, as he being the quest of honour would respectfully arrive much later than the rest of us. Antonia had sent a few people out to a few different stores in order to get candles, forks and plates, in hope that between several different people the odds of finding the three remaining ingredients would be greater. One person returned to the gallery with a box of forks, which Antonia had shown some sign of relief, but the candles and the plates were still needed. Ettore arrived at the moment the box of forks was placed next to the cake, just after the clear box wrapping was removed. As Ettore was slowly escorted towards the cake, being greated by everyone, Antonia was clearly nervous, in that so much attention was placed on the cake design and its presence, the small details of how to consume the cake were overlooked. There are no candles and plates! When Ettore arrived at the cake, standing in front of this work of art, I personally thought, is Ettore in awe of the cake, or is the cake in awe of Ettore? Antonia spoke for a few minutes and then endearingly apologized to Ettore for not having any birthday candles, or plates. Antonia mentioned that she sent a few people out to find some and they should be back shortly. Ettore did not seem to even hesitate, or even say that he has a solution. Ettore simply reached into the box of forks grabbing a handful, then started on the run of the bottom tier, placing forks ( inserting prongs down ) in even intervals approximately 4” apart. After Ettore inserted a few, others helped to finish all the tiers. This was magical! Such a spontaneous artistic interpretation, not just to solve the candle problem but as you will discover in a minute, Ettore had solved the second problem, whether he or we realised it. Antonia then began everyone in a very celebratory singing of Buon Compleano to Ettore. As soon as the singing stopped, Antonia once again apologized for not having any plates. Ettore without hesitation, looked at the cake, put his hand around a fork, rotated his wrist 90° which tore a chunk of the cake out with the prongs of the fork, simply saying “no plates necessary” then he ate that particular piece of the cake. This was absolutely magical, whether Ettore realized it or not his candle solution was also the solution for consuming the cake. I, like a few others who witnessed this up close made sure to grab a fork, tear a chunk of the cake, and consume it in Ettore’s fashion. I even felt more privileged because after all the forks were removed from the cake, leaving a visual evidence as if several hungry rodents has consumed the cake in an organized manner. The plate messenger arrived and Antonia cut the cake in a traditional manner, placing slices on individual plates. I do not want to sound naive but I had heard the name Ambasz on a few occasions while working in Ettore Sottsass’s studio, but I was not quite sure what the reference was to. When I moved to NYC, I was staying with my dear friend Constantine Boym, and after a few days I picked up his Yellow Pages and opened to Designers. The first name which appeared was Ambasz, Emilio. I had just been in Milan and figured the name Emilio would have a reference to European design, which I had grown a taste for. I called his office and was granted an interview. I said this as confidently as I could, but during a slight pause, I was afraid Emilio would put me on the spot and ask me what projects I specifically liked. Emilio did not do so. I am sure Emilio realized that perhaps I was absolutely unfamiliar with his work, or if I was, my Yellow Book reference caught his attention. What ever it was, he probably understood that in the end I adjusted and told him what he wanted to hear, that his new book by Rizzoli was making its rounds through the design community. It came down to Emilio being comfortable with me and my work for Ettore that he knew I would be a good fit in his studio. The initial toothbrush was the whale, which was visually pleasing, portraying a comfortable toothbrush to hold and use. The reference was inate for me: the toothbrush bristles representing the whales’ baleen. The baleen is a filter-feeding system, where food such as microscopic plankton is captured, as the toothbrush bristles capture food particles. The whale also represents a graceful, calm, smooth, non-harmfull living creature: so psychologically soothing. Ideas may expose them selves in the slightest fashion, so it is up to you to observe it, and more importantly interpret it. When I was sketching at a café I glanced at the table next to me , specifically noticing a coffee cup, and next to it was an ashtray, also white, but with three holes on its rim. I immediately sketched the combination of the two. The sketch was no bigger than 1/2” which I placed in the upper corner of a sketchbook page which I just filled with several ashtray ideas. I drew it rather subtlety because I was not sure what to make of it, but I loved it because it encompasses all the social issues I was looking for. Smoking and drinking coffee are “ the “ two social activities we have all been involved with , in some form or another, and each we have a very personal relationship with. If these two activities are truly social, then what are they, and what do they represent for each culture? I have been fortunate enough to live in the U.S.A., Italy, and France, each having very different relationships with smoking and coffee consumption. In the U.S.A, I am not sure if it is a relationship or just an addiction, because how can anyone get any pleasure out of drinking colored water, and in such volume? Americans arrive at their table, and the waitress immediately brings a large pot of coffee, filling the cup first before even discussing the menu. Then during the meal the cup if filled at least once more, then finally when the meal is finished. Is this like American beer, which is weak and watered down, so you have to drink it in large quantities in order to feel its affects? Perhaps it is more of a psychological fix, verses physical? To European standards, the quantity and quality of American consumption it disgusting, borderline vulgar, and the added fact that Americans will not even hesitate to put their cigarette out in their coffee. This combination of the two activities makes for an intriguing object. This ashtray in itself is a stimulant: for conversation, and stirring emotion. Isn't that the purpose of art? I do not know about the rest of the world, but the reaction in France to this ashtray in general was one of disgust. There is a social art to drinking coffee and smoking. Each is done in its own time, and never rushed? How could a good conversation be rushed anyways? Coffee is a delicate activity, truly a pleasure, and the idea of using a coffee cup as an ashtray is vulgar. The French should love it, it is very Duchamp. In Italy they consume at a frantic pace. In fact it as if they arrive at the espresso bar, say a few greetings, then get their espresso and pull it through a syringe to inject directly into their veins for an immediate fix. Their “ fix “ is satisfied, then you are off again until your next fix, which is usually no more than an hour away. In Italy the reaction has been one of curiosity towards this ashtray. They do find the humor and intrique in it. No matter what the culture, this ashtray reached them and they discuss it, so I have accomplished what I wanted, a conversation piece. My ashtray was for a collection called OWO, a company founded by Starck. The company was later purchased by Alessi, but only Starcks’ ashtray was produced by Alessi. A single ashtray of mine remains in a glass case in the Alessi Design Museum. Every year I use to inquire with Alessi, concerning my ashtray entering their production, and every year I received the same response, “no, this is a politically incorrect object.” I always felt my ashtray, even in the initial years, made in ceramic, was a sculpture, a conversation piece, and not necessarily for use. Now, especially with the general social shifting towards non smoking, my ashtray speaks louder than ever. Perhaps I will produce an edition in bronze. The chimney “Vesuvius” was a prototype which was included in an exhibition titled “Art & Tabac”, which was curated by Pierre Restany. The exhibition was at Galleria EOS in Milan, and Palazzo delle Esposizioni di Riccione Forli Italy and a traveling exhibition through many galleries and museums in Europe during 1994-1996. A collection of occasional tables, in production until 2011. I was probably spoiled to have had Knoll as my first produced product, because from the initial review of sketches to public presentation, was less than 6 months. I am very grateful to Carl Magnusson for his instinct, drive, and belief in my work to direct it into production. I remember when I was working in Ettore Sottsasss’ office and viewing a full scale pen and ink rendering for one of his chairs for Knoll. It was my first introduction to Knoll. When I was drawing my full scale pen and ink renderings I remembered how beautiful Ettore’s was. In January 1991 I wrote a letter to Andrew Cogan. I was directed to drop off my portfolio, which I did. I figured with my relationship with Ettore Sottsass and having working with Emilio Ambasz for a year ( where I also heard the name Knoll bounced around the studio ) there may be some interest to view my work. I was very young comparing myself to Knolls designers, and famous they were, so I was a bit hesitant. I did not have that much experience, but I thought I had a unique gift for design. A few weeks later I received a call, mentioning Knolls’ interest in meeting with me. We set up a date and time, and just before the meeting, I called and cancelled, making up some kind of excuse that my schedule had changed. I simply felt that the timing did not feel right. Perhaps it was my young age, but for whatever reason, I felt the timing was not right. I moved to Paris and after living there for almost a year I had to return to the United States on December 12, 1991. Why would I return to the USA after living in the beautiful, inspirational Paris? I ran out of money. Now, after living tranquilly in Paris, simply inventing products and approaching Europe’s leading manufactures I found myself without a design rush, without a new adventure which could keep my creative wheels turning. I was 29 years old and living in my parents basement, in the Chicago suburbs. Believe me I cried like a baby when I had to leave Paris and return to the states, but here I was. How was I to stimulate myself. I called Carl Magnusson ( Knoll’s creative director ) in the beginning of June 1992 mentioning that I will be in New York the week of the 27th and if possible could I present myself and my work. I did not expect or plan to be in New York at all but I sounded confident and portrayed myself as busy. Carl set a date to meet on June 22, and I immediately purchased a ticket to New York. Now my creative wheels were turning. I presented my work, travels, and experiences, and no specific furniture ideas or sketches. This meeting was simply to meet each other, although he probably expected me to present ideas. Perhaps Carl liked my informal, relaxed demeanor, reinforced when he said to me when I first met him “you are a bit late for your appointment”. I enjoyed his sense of humor, his quick wit, and I replied “I guess I had the year wrong on our original appointment.” On July 20 I received a call from Carl. He mentioned: “ he will keep me in mind.” I wrote Carl a thank you and I remember when we met in New York, his specific interest for the ashtray I designed for Starck “NIKI”, so with this thank you letter I included the prototype. I knew he would include it on his wall of “cool” things. Like all designers, we have a wall of cool things. On November 10 I received a call from Carl. He called to tell me he was sending me a product brief and a contract, and that this project was going to be fast. In fact, to be presented the following June at Neocon in Chicago. The product brief was timed perfectly because I was going to Martinique from December 8 – 15 and would focus that time to sketch for Knoll, and I would return to New York on the way back to Chicago. So after relaxing in Martinique ( perhaps too relaxed ) I returned to New York on December 15, 1992, and met with Carl on the 17 to review sketchbook # 6, which was designated for this project. I had made copies of all the pages in the sketchbook ( 59 ) plus an additional ( 24 ) sketches, laying all copies on his work surface. Carl went through one by one, not saying a thing until he was finished. Then he picked two pages, and said “these are my two favorites”, adding “which are yours?” I had to think quickly on my feet. Here was the person whom would get me in and through all the channels and into production. I thought atleast the two sketches were a starting point. I replied “those are also my two favorites.” Carl then said he needed all the drawings, especially all the details by the end of the first week in January. I had my work cut out for me. I produced full scale pen and pencil renderings for several variations, along with all detail drawings. I remember when I first met Carl on June 22, and I was drawn to his wit, instinct and his eye for detail. Carl did a magnificent job of editing my sketchbook, and he was absolutely right with his two choices. As strange as it may sound the two pages were: the first and the last page of my sketchbook. The first page is the Saquaro ® and the last page revisits the Saguaro ® but there is a sketch which the Toothpick ® developed from. Whenever I watch The King of Comedy, there is a scene which reflects a classic moment in my life. Now I had a great project, but where was I to focus, develop it? I did not have a studio. We all here the story of an inventor starting out of a garage but my studio existed solely of a ping pong table which was located in my parents basement next to the washer and dryer. Now, I missed more than ever, my daily walk through St. Germain in Paris, and this was a far cry from the creative energy I had felt living in Paris. Well, I made the best of it, excited with detailing my sketches. I remembered the time and skill Ettore put into his full scale Knoll drawings, and I focused on doing the same. In The King of Comedy there is a scene were Robert De Niro ( Rupert Pupkin ) is down in his parents basement, practicing his comedy routine. It is quite brilliant because you see Rupert from the back delivering his comedy routine to an audience, which exists of an enlargement of a talk show audience, applied to the wall of his basement in the form of wallpaper. As Rupert is delivering his act, he is interrupted by a voice saying rather loudly “Rupert“, and Rupert is not distracted, which to me just seems like someone in his wallpaper audience is yelling Rupert, as a form of encouragement. Well, a few seconds later we here “Rupert, what are you doing down there.” Now we realize it is Ruperts mother about to announce that dinner is ready. Rupert answers rather annoyed “Mom, I’m busy” and as he says it he looks at his crowd as if to apologize for the momentary interruption from a heckler. I particularly love this scene, because when I was working on my drawings, drawings tapped to the ping pong table, my mother was directly behind me doing the laundry. She had just turned on the dryer. Now I was trying to focus with the noise from the washer, dryer, the heating ductwork which ran directly over my head. What made this scene even more maddening is that my father opened the basement stairs and stated ( in a rather frustrated fatherly voice with a definite undertone of why is my 29 year son living at home in his basement ) “Larry, telephone call.” Now my dad did not page me up out of the basement, rather he brought the phone down to me, handing me the phone and as he did my mother asking my father “who is it?” All this was done without even trying to cover the phone in any way, so that the person on the other end does not hear what is going on , on my end. Well, when I said hello, I heard “Larry, this is Carl.” It was definitely a moment to remember. I am sure that Carl understood the insane moment I was living in, and keep the embarrassing truth of my situation to himself all these years. On January 6,1993 I sent ( 36 ) full scale prints and ( 8 ) models. Carl selected ( 8 ) versions of the table and started prototyping. I flew to New York on February 11 to see the first prototypes. On March 30 I flew to New York to see the second generation of prototypes. The “Cactus Collection” was presented in June at Neocon in Chicago.